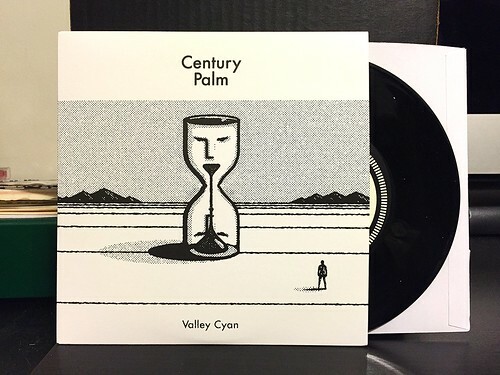 I Buy Way Too Many Records Dot Com: Century Palm - Valley Cyan 7"
Century Palm - Valley Cyan 7"
Valley Cyan is the second Century Palm 7" that I received for review (the first was reviewed yesterday, in case you missed it). As with their debut, there is a definite new wave lean to these songs, with even more liberal use of synth this time around. The title track "Valley Cyan" has a steady groove fueled by ringing out guitar strumming and sitar-like accompaniment from the synthesizer. It's pretty catchy and just as good as either song on the band's first 7". Though I will say it has a heavier lean towards the new wave sounds of the 1980's than anything else the band has released so far. I'll admit, I'm not sure what to make of the B-side "Accept." It sort of sounds like the kind of song that would be playing in the background of an early John Hughes teen movie while the main hero contemplates their sadness at the low point of their story arc. It's slow and for reasons I can't explain, the vocals take a severe turn from the lighter side to full on, baritone Leonard Cohen style brooding. It's my least favorite thing I've heard from the band so far, but it's also something of an outlier, so I couldn't say if this is the sort of thing we'll hear more of in the future. Regardless, three pretty strong songs out of four over the course of two 7"s is a pretty solid start for a new band. Digging around online a bit, it looks like the band has more records in the works. I'm looking forward to hearing what comes next. Iron Chic - Ys 7"
The Bingers - Gonna Get You 7"